In honor of St. Patrick’s day and the whimsical month of March, this month’s ‘Amazing Woman’ hails from Scotland. Winifred Maxwell, the Countess of Nithsdale (c. 1680-1749) met her husband, William Maxwell the 5th Earl of Nithsdale and a Catholic Nobelman at the French court. At the time, Lady Winifred’s father, the 1st Marquess of Powis, was in exile and Winifred’s mother became the governess for James Francis Edward Stuart, the son of the late King James II of England (James VII of Scotland). Lady Winifred met William Nithsdale while he was visiting France to pay his respects to the former King James II and were married soon after. They lived in Terregles, Dumfriesshire, Scotland. Sixteen years into their marriage, William Nithsdale joined the famous Jacobite Rebellion of 1715. He was captured at the Battle of Preston and tried for treason and sentenced to death, which effectively landed him in the famous Tower Prison of London. Winifred, now a mother of five, traveled to London and made a personal appeal to King George I to ask for clemency, but received none. On the night before William’s execution, she visited the prison with her maid and two friends and gave the guards a generous amount of drinking money. Inside the prison, she shaved off William’s beard and dressed him in woman’s clothing. She then proceeded to smuggle him out of the prison. The cloak she used that night is still held by the family. The couple hid in London until William could escape to France disguised as a servant of the Venetian Ambassador. Winifred then traveled to Scotland to manage her family’s estate. She eventually reunited with her husband at the exiled court of James Francis Edward Stuart – yes, that James, the son of King James II, the same man that Winifred’s mother had cared for as a child. This James Francis Edward Stuart came to be known as the Old Pretender and sought the British throne during the Jacobite Rebellion – yes, the same rebellion that sent William to his death for treason. It sounds like the plot of a brilliant movie. For being brave enough to risk her neck to save her husband and smuggle him out of prison dressed as a woman, Lady Winifred Maxwell is my Amazing Woman for the month of March. While this isn’t my first conference, I still love when I get shiny pictures to share. If you are in Northern Utah on April 27th this is a terrific conference for a great price. Head over to the League of Utah Writers webpage for more information. I’ll be teaching “Helping Characters through Tough Transitions using the Kubler-Ross Grief Cycle” at 5 PM. Throughout history there have always been people willing to risk and sacrifice to push forward in their fields. Some become renowned scientists and some help shape the understanding of millions through the words they write. A big part of the message I want to share with the world is that anyone can be excellent in their chosen field if they are willing to work and sacrifice. The main characters in my books strongly believe this and are all at different points of this process. Which is why I want to share about scientific pioneer and two times Nobel Laureate, Marie Curie. While most people know that Marie Curie was the first woman to win a Nobel Prize in 1903 for her discoveries of radioisotopes radium and polonium, did you know that she almost wasn’t mentioned? The award nomination originally only included her research partner and husband Pierre Curie and their contemporary Henri Becquerel. During World War 1, Marie Curie invented a mobile x-ray unit called a “Little Curie” installed it into “radiological cars” and trained 150 women to operate it. This mobile x-ray unit was critical to getting help to front line injuries and battlefield surgeons. Even more impressive, to further help the ware effort Curie learned to drive and operated her own “little Curie.” It is estimated that through her efforts the total number of soldiers who received x-rays during the war exceeded one million. This makes Marie Curie a War Hero. Marie Curie’s daughter, Irene Joliot-Curie, won her own Noble Prize in 1935 for discovering a way to create artificial radioactive isotopes for use in medicine. Sadly, Marie died before the announcement was made in 1934. Marie Curie kept a sample of radium next to her bed to use as a night light. Check it out! The Create Loud Podcast brought me on the show to discuss the writing process and the importance of embracing your own uniqueness. January is all about new beginnings and I, among others, have beat the goals and resolutions drum loudly and with gusto. But, have you ever thought about where the word January comes from? Until recently neither did I. That was, until I ran across an article about Janus, the Roman god of beginnings and endings. Seeing as history holds it’s own special magic, today we will explore the history of how January got it’s name. Both Rome and Greece both celebrated many gods, each with a very specific purpose. The majority of these gods were shared between the two cultures, each with their own specific name. The Roman Jupiter is the Greek Zeus and stands and the King of the gods. Neptune is Poseidon and is the god of the sea. Venus is Aphrodite and is the goddess of love and beauty. Janus, in contrast, is purely Roman with no Greek equivalent and is the only god with that distinction. In ancient history, Janus was the god of beginnings and endings and presided over entrances and exits. To represent this role, his is often depicted as a two-faced god, or a god who can look in both directions. Unlike other Roman gods, there is evidence that Janus actually lived. One of the myths declares that he ruled alongside the Roman king Camesus and was exiled to Thessaly. His children included Tiberinus, which is where the name of the Tiber river originates. He built a city on the west bank of the Tiber named Janiculum. Shrines to Janus are generally located near river crossings or bridges and are themselves passageways to enter and exit places of reknown, the most important of these being the shrine near the Argeletum entrance to the Forum. This shrine had bronze doors which were kept open in times of war, and closed in times of peace. According to Roman historian Livy, these gates were only closed twice between the 7th and 1st centuries BCE due to the Roman tendency to always be at war. Many modern day sources will attribute Janus in the naming of January. To my surprise, I found this isn’t technically true. There is an older attribution to Juno, the queen of the gods. While it makes sense to honor her in this way, I will hold with modern sources that persist in tying January to Janus. January marks both the end of an old year, and the beginning of a new one. It is the doorway marking the entrance of the earth into another cycle around the sun. Janus is the guardian of the same. It simply fits better. Last week I joined Jason Woodland on his podcast “Always the Journey.” We had a great time talking about everything from favorite movies, to the influences of travel, to the color that represents my work. Be sure to check it out! Castle and monastery, church and fortress, Mont-Saint-Michel in northern France has been a bit of everything over its thousand-year plus history. Which is what makes it perfect material for a post here on the blog, where I seek to find magic everyday. I’ve mentioned it before, but I love ancient castles and churches. My Instagram is loaded with gorgeous pictures of them because they stir my imagination and tell so many stories. I visited Mont-Saint-Michel when I was a young naive teenager. At the time, it was just another wonderful place to visit in a series of interesting places I’d been on a long trip through France. Looking back, I wished I had taken more time to soak in the history. I’m making up for that now. The earliest history of the island extends back to the 8th century, when the island was called Mont Tombe. “Tombe” meaning grave in Latin evokes the feeling of a graveyard or a final resting place. There is a secondary, and far more fitting, translation as “mount hillock” meaning a raised place. For anyone who has visited the island, it fits this description well. From base to tip, the island rises over 260 feet out of the ocean, and all of it rocky unforgiving granite. I remember my legs burning as we trekked up the steep streets toward the monastery. The location of the island is unique as it historically it could only be reached during low tide and was surrounded by silty sand that was prone to becoming quicksand. This made the island easy to defend as the assailants couldn’t continue their fight for risk of drowning. It was also halfway between the two power Duchies of Normandy and Brittany during the early Middle Ages, which made it the target of the two powers and through the ages it changed hands frequently. At one point it was invaded by Vikings. Fast forward to 1204, the Breton Guy de Thouars, an ally to the King of France, tried to take the island in a siege. In the process, he accidentally set the main buildings of the monastery on fire, destroying the very same buildings he wanted to occupy. The King of France at the time, Philip Augustus, or Philip II, was horrified that a holy site was damaged in connection to him and offered funds for a major restoration and expansion which included many of the Gothic style buildings we see today. Throughout the following hundreds of years the island continued to be an area of dispute. Each successive conqueror added and destroyed parts of the island’s structures until we reach the present day. For more history, there are references below. Modern day Mont-Saint-Michel can be reached by a long bridge built specially to allow the flow of tidewater underneath. Thrill seekers are still allowed to approach over the sand during low tide, however there are signs everywhere warning of the dangers of quicksand. Do you have a favorite castle or magical place? Share about it in the comments below and I might do a feature on it in the future. I swear I’m not teasing you about doing a cover reveal. It will happen, and it looks like it might be by next week’s post. This week we pinned down a few more needed pieces to create the advance review copies for distribution. If you love reading epic fantasy, and even better, love giving reviews, please send me a note! Also, I’ll be at the Eagle Mountain Writing Conference this weekend. If you are there, come say hi! The Palace of Fine Arts is one of the few sights of the Fantasy in Real Life Series that I’ve actually visited. Located in the marina district of San Francisco, this stunning structure is a magnet for photographers and artists alike. The Palace was originally built as a part of the Panama-Pacific Exhibition, a world fair that ran from February 20th to December 4th in 1915. This particular fair was to celebrate the completion of the Panama Canal and also showcase San Francisco’s recovery from the 1906 earthquake. 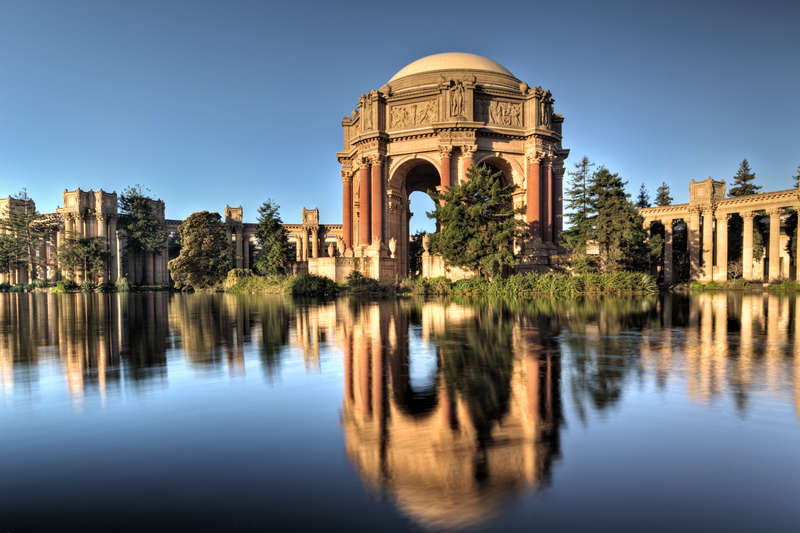 The Palace of Fine Arts was one of ten separate palaces that dotted the over 600 acre exhibition, the other nine palaces were for education, liberal arts, manufactures, varied industries, agriculture, food products, transportation, mines and metallurgy, and machinery. The exhibition was not built to last, the Palace of Fine Arts was built primarily of wood and then covered with a mixture of plaster and burlap-type fiber. The original intention was for all the palaces to be torn down at the end of the fair, but the Palace of Fine Arts was so popular that the Palace Preservation League was formed before the end of the fair. Despite their best efforts, the Palace fell into ruin and fell to vandalism. In 1964 the original Palace was torn down save the steel structure of the exhibit hall, and rebuilt using newer more durable materials, like lightweight poured-in-place concrete. In 1969, the exhibit hall became home to the interactive museum, the Exploratorium. For more of the Fantasy In Real LIfe Series, Click here! 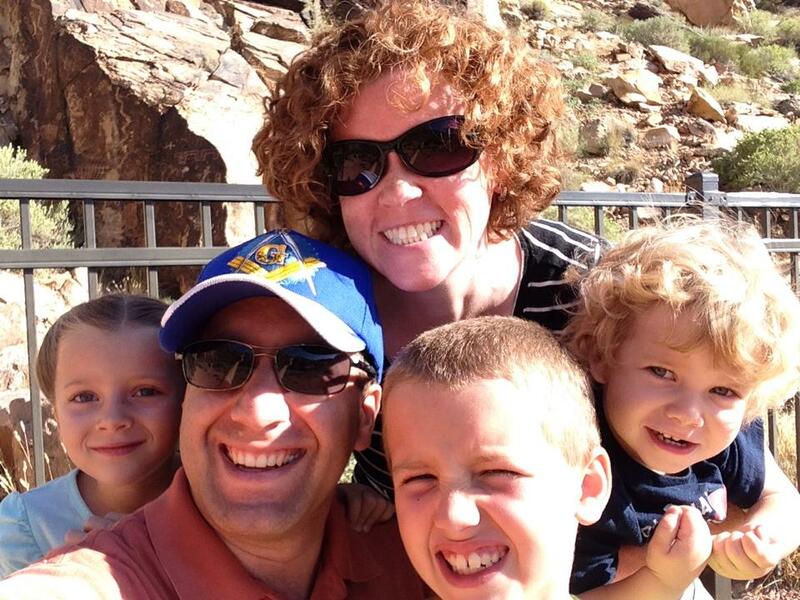 The clan. You can see some of the petroglyphs on the rock on the left. 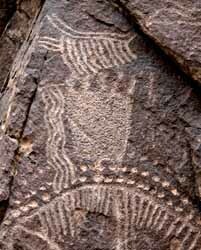 For a moment this weekend the past and present collided as my family visited the petroglyphs over in Parowan, Utah. This remote place has been essentially untouched for hundreds, if not thousands of years. No one is sure what the meaning behind the pictures are although some have made guesses. They could be instructions to hunting grounds or nearby settlements. They could be accounts of important events. Whatever they are, they must have been significant and special. 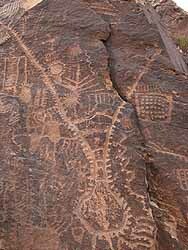 There are miles and miles of rock in the area and yet the petroglyphs are only found in this one very localized place. I can’t help but think what stories are hidden within these cryptic drawings. It gives me all sorts of cool ideas for my own stories.